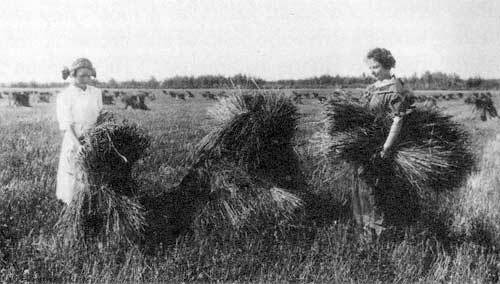 Mary Kinnear, A Female Economy: Women’s Work in a Prairie Province, 1870-1970. Montreal, McGill-Queen’s University Press, 1998, xiv, 212 pp., illus. ISBN 0-7735-1734-0.$55.00. To fully appreciate the significance of Mary Kinnear’s book, A Female Economy, it is instructive to look back to the mid-1970s. In the preface to A Harvest Yet to Reap: A History of Prairie Women, published in 1976, Candace Savage described how she and her three co-authors, all women who grew up in the 1950s when role models were “Mom and Debbie Reynolds,” had found material on the everyday lives of “ordinary” women difficult to come by, particularly from “non-white, non-English-speaking communities.” They also discovered “heroines we could call our own,” an earlier generation who had questioned traditional roles of women, but whose lives had been forgotten. “We began to realize how powerful our image of the past had been in limiting our sense of our own possibilities. There is a strength in the knowledge that among our foremothers were women who confronted their pain and frustration. Also during this period, Women at Work: Ontario, 1850-1930 was published by the Canadian Women’s Educational Press in 1974, the annual meetings of the Canadian Historical Association included a full session on women’s history for the first time (1973), and the Canadian Committee on Women’s History was established by a group of young scholars (1975). At the University of Manitoba, 1973-74, Mary Kinnear, professor of history at St. John’s College, introduced a course in women’s history, only the third to be offered in Canada. In the preface to A Female Economy, Kinnear describes how she eventually came to write this book—a long and circuitous journey that began when she arrived in Manitoba in 1965. Raising a young family while establishing a career as a historian, “I wanted to know how other women had moved through these same stages of life. How had previous generations of women coped ...? What had they thought about their working lives?” A search of the history books yielded little information on the history of local women, however, with the exception of Catherine Cleverdon’s book The Women’s Suffrage Movement in Canada. But in the 1970s there was “a sea change.” Along with a renewed interest in feminism and women’s politics “came a renaissance in women’s history.” Until the mid-1970s Kinnear was the only female in the history department. With the support of colleagues and students, and grants from the Social Sciences and Humanities Research Council of Canada, Professor Kinnear was able to expand her research to “generate historical statistics” and make increased use of oral history. Thus, the author’s research and body of work over the past two decades make her eminently qualified to present this overview of women’s work. In 1982 she collaborated in the organization of a conference that considered what resources would be necessary to support research into women and the Canadian economy. In 1987 she co-authored, with Vera Fast, Planting the Garden: An Annotated Archival Bibliography of the History of Women in Manitoba. Two publications edited by Kinnear resulted from a 1986 conference on women in history in Manitoba: the anthology First Days, Fighting Days: Women in Manitoba History (1987) and a theme issue of Manitoba History (Spring, 1986). Her biography of Margaret McWilliams was published in 1991, and In Subordination, a study of professional women, in 1995. A Female Economy draws from much of this important new research by the author and others. The sources cited in the bibliography to the book, 22 pages in length, clearly indicate just how rich a harvest has been reaped since the 1970s, now that the climate is finally conducive to the growth of this field of history. 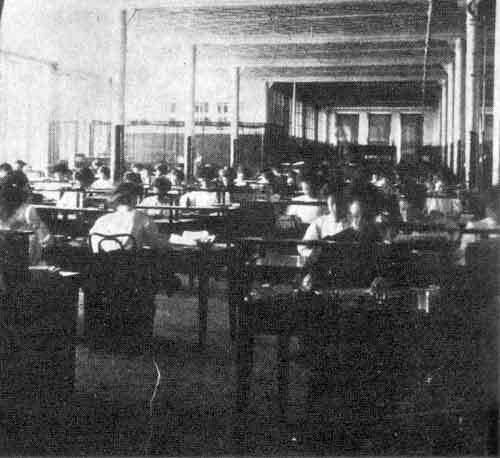 Female office clerks at the T. Eaton Company, Winnipeg, circa 1910. A Female Economy is carefully organized. In Chapter 1: “Parameters,” Kinnear explains that the book “analyses how women disposed of their labour during the century from 1870 to 1970 in one of Canada’s prairie provinces—Manitoba. It describes women’s work both paid and unpaid, within the family and without.” Despite certain features peculiar to Manitoba itself, Kinnear maintains that the details of work in the local setting derived from oral and written archives “mirror the larger picture of women’s occupations in Western society generally, and thus have wider implications.” Demographic data and statistics are essential to this history, but wherever possible the author lets the “ordinary” women who are the subject of the book tell their story in their own words. In addition to oral history she incorporates material from sources such as the impressive body of literature by women authors. In Chapter 2: “Foreigners on Someone Else’s Ground,” Kinnear provides a profile of who the women of Manitoba were. She points out that besides being different from men, women differ from each other. Though they shared many common experiences, women’s lives were affected by class and income level, and in Manitoba, by ethnicity as well. She describes the role of the First Nations women during the fur trade period prior to settlement and provides an historical overview of the economy and culture in 1870. (In the historical background material for this early period the author is on less-familiar ground, and here she might have been better served by her editors, who should have caught a few small factual errors. For example, the First Nations people in Northern Manitoba were the Chipewyan, not the Chippewa (p. 13), and the HBC and North West Companies amalgamated in 1821, not 1825 (p. 12). In Chapter 3, “Prescriptions,” Kinnear describes how, although women’s work was largely unexamined by economists, there were various “professional pundits” who commented on what sort of work women should do. In Manitoba, particularly during the period of immigration and settlement, immigration literature revealed much about contemporary assumptions about women’s work. Other sources included newspapers, novels, pamphlets, legislation, and government reports. Manitobans read and were influenced by feminist authors from the United States and Great Britain. And when the anarchist and libertarian Emma Goldman visited Winnipeg in 1908, fifteen hundred people turned out to hear her speak. There were also a number of widely-read Manitoba journalists and writers who championed the rights of women, including Nellie McClung, J. S. Woodsworth, Margret Benedictsson, and Francis Beynon. In Chapter 4: “Education and Training,” the author states that the introduction of compulsory education in 1916 for all children aged 6-14 improved girls’ chances for a basic education, but women saw little point in taking advanced education when their employment would end with marriage and motherhood. Kinnear notes that even as increasing numbers of women entered university after World War II, they tended to be concentrated in areas such as nursing, education and home economics. In the post-1870 period virtually all women performed homemaking tasks, but the significance of this contribution was never taken into account by men or economists as “real’ work. This chapter also includes fascinating information on the increase of state intervention in the home, “intruders in the nursery” (child care professionals), the obstacles to family planning, the ongoing problem of adequate daycare facilities, and the rise of consumerism, which led some women to involvement in political activism. In Chapter 6: “Farm Work”, the author points out that although women were equal partners to the men in their contributions to the farm’s economic success, they received little recognition of the fact and for many years, little protection under the law. They also had fewer labour-saving devices than urban women, which added to their already-heavy workloads. One of the most vivid accounts in the book is the appendix to this chapter: “Harvest Time 1931” in which a Dutch immigrant describes her 20-hour days while providing meals for the threshing gang. It is exhausting just to read about it, and gives one a better appreciation of what farm women (including my own grandmother) endured. In Chapter 7: “Paid Labour,” there is an overview of changes in women’s participation in the labour force. In the early period, the few women who worked retired upon marriage. In 1891 only 9 per cent of the female population of working age was in the labour force, compared to 80 per cent of men. By 1921 the figure was 20 per cent, and by 1971 it was 42 per cent, while the figures for men changed little. Up until World War II, more women worked in domestic service than any other job. By 1941 office work had become the leading occupation. Many women also worked in factories, and as sales clerks, and in the professions, as teachers and nurses. In the professions such as teaching where women were in the majority, the higher paying administrative jobs were still held by men until late in the century. Women in the workforce encountered sexual harassment, and discrimination, e.g. The Bay employed Jewish women, but Eaton’s would not, except in the mail order department. Women faced dismissal if they married. and most companies would not hire married women. In Chapter 8: “Public Service Work,” the author includes a sampling of women’s organized volunteer work. She also examines political activism before and after the acquisition of the vote, and the challenges encountered by the new generation of women who entered the world of electoral politics. Haying at the Crossley farm near Grandview, Manitoba, 1916. A Female Economy makes an important and original contribution to women’s history, labour history, and the history of Manitoba. The author set out to provide a “more balanced vision of the past” so that “we are better able to discern and we can begin to assess, the historical dimensions of women’s work”. In this she succeeds. The book is both a gathering point for recent research and a starting point for further research. A Female Economy will be of interest to general readers as well as academic researchers, so it is regrettable that the financial constraints on academic presses may limit access to this work by many of the “ordinary” women who are the subject of the book. It is a slim volume with no dust jacket, a drab brown cover, too-few illustrations and a price ($55.00), that is too steep for most. This is a book that merits publication in a more popular format, and with more of the fascinating illustrations that exist in archives of prairie women at work. For now, it is hoped that public libraries, as well as academic libraries, will purchase it so that it is more readily available to those who won’t otherwise have access to it. One final note. There is a legitimate concern that the current climate of fiscal restraint and funding problems at Canadian universities could impede the further research that this book encourages. As historian Deborah Gorham of Carleton University wrote in 1997 of this funding crisis: “For women’s history this has meant many losses, the most important of which is that in the present situation, very few younger colleagues among historians of women are able to find academic employment, much less the time and resources to continue their research after graduate training.” The young prairie women of today are as spunky and determined as their foremothers. I have no doubt that they will find a way to carry on this important work.